Who says you can’t eat well while backpacking? After hiking all day, end the night with a dinner that isn’t short on nutrition or taste. Below is our collection of backpacking dinner recipes to prepare before the hike and enjoy prior to your night’s rest. Because the last thing you want to do while hiking or backpacking is dirty pots and pans, most of our dinner recipes can be prepared in just a single zip lock bag! However, Wild Backpacker recommends that when adding boiling water to your baggie, always use heavy-duty or freezer zip lock bags. Although there have been no claims of injury or illness, Ziploc® states their baggies are not intended to be used at high temperatures, so use at your own risk. At home: Combine mix and milk into a quart size zip lock bag. On the trail: Gently stir 1/2 cup water into bag. Make the dough into flat circles. Cook on pan, turning them when light brown. At home: Combine the couscous and vegetables in a zip lock plastic bag. On the trail: Add just enough water to cover. Stir well. Let sit for 5 minutes. Just before serving, stir in the tuna. At home: Combine everything in a quart freezer zip lock bag. If you are bringing a foil pack of chicken, carry that separately. On the trail: Bring 1 cup of water to a boil. Add to rice mix and steam inside bag for 1-2 minutes or until the rice is tender. Serve topped with chopped cashews. At home: Combine everything but cheese in a quart size freezer zip lock bag. On the trail: Bring 1 cup of water to a boil and then add to the zip lock bag. Simmer for 5 minutes or until the pasta is cooked. Add more water if needed. Stir in the cheese just before serving. Note: True Lemon is also available at www.truelemon.com or some grocery stores. You can also substitute 1 teaspoon citrus juice or zest per packet. At home: Combine everything, except chicken, in a quart size freezer zip lock bag. Carry the chicken separately. 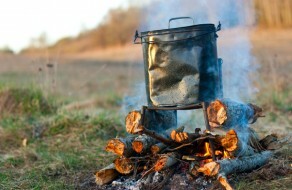 On the trail: Bring 1 cup of water to boil. Add the quinoa and spices. Reduce heat and simmer for 10-15 minutes, or until quinoa is tender. Add the chicken, toss and serve. At home: Combine everything, except the Parmesan, into a quart size freezer zip lock bag. On the trail: Bring 1 1/2 cups of water to a boil. Add the polenta and simmer until cooked and creamy. Top with the Parmesan cheese.